I’ve done a few crayon crafts this past year (see here and here) and if I would have known this little trick a few months back, I would have been one happy camper! 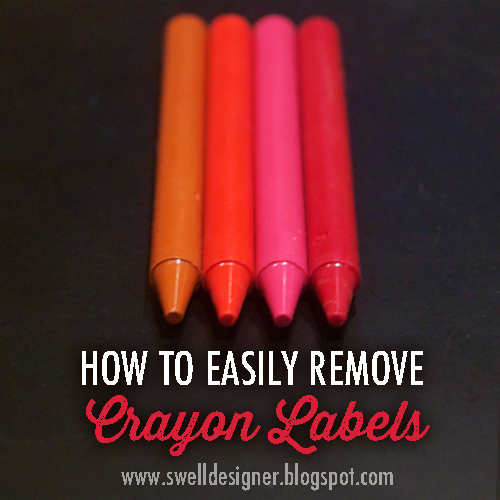 The other night, I knew there had to be a simple way to remove the labels from crayons. A google search revealed a post by 4 Herreras, and I had to recreate their magical method for removing those pesky little labels! What makes the magic happen, you ask? Well, all it takes is a bowl of warm water to do the trick. I’m was so in love with the process that I had to do this little video showing you how it works! Now the main reason I was removing the labels was for a craft project that turned into a complete CRAFT FAIL! Yikes, I plan on sharing that soon, so hold tight. You are not going to believe the goofy mess I got myself into.